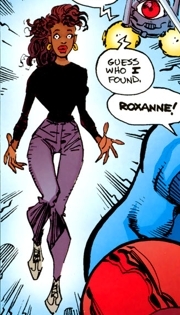 NOTE: Roxanne Wells is owned by Erik Larsen and Gary S. Carlson. Roxanne Wells was a television news reporter who first discovered the story involving the alien warrior known as Vanguard. She assisted the hero in clearing his name when he was in trouble with the authorities which gained her trust and an exclusive interview. Vanguard and Roxanne struck up a romantic relationship shortly afterwards. When Vanguard decides to leave Earth to head back to his home planet, he asks Roxanne to come with him. She first visits her mom who is now suffering memory lapses and then makes a TV broadcast that she is leaving Earth. She leaves with Vanguard and his crew. During their journey she is briefly captured by Mek who is the Vanguard’s family drone, but is saved by Vanguard. She also shoots Deathwatch to death before he is able to kill Vanguard. She remains with Vanguard in order to help rebuild his ship.